The Illinois Hispanic Chamber of Commerce (IHCC) is proud to present the 2014 Make the Connection! 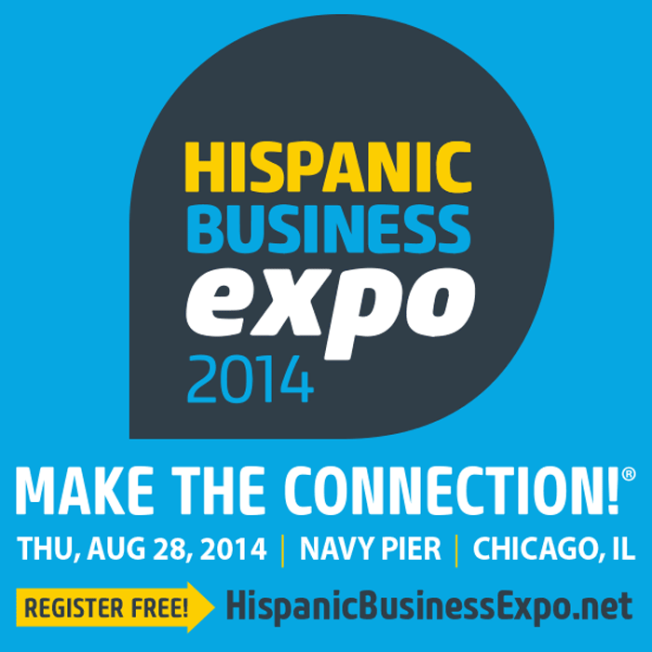 Hispanic Business Expo on Thursday, August 28, 2014, at Chicago’s Navy Pier. This is a free event – all participants must pre-register at www.hispanicbusinessexpo.net. The Hispanic Business Expo continues to be one of the nation’s premier events for Hispanic businesses and professionals. This single-day event is intended to help Hispanic business owners establish relationships with leaders from both the corporate sector and government agencies. The Expo kicks off with a breakfast in the Navy Pier’s Grand Ballroom at 7:45 a.m. With more than 1,200 attendees, the Opening Breakfast serves as a platform for business and political leaders to engage in diverse business development topics. Speakers include U.S. Senator Richard Durbin; Illinois Governor Pat Quinn; U.S. Representative Luis Gutierrez; Chrispher Begy, U.S. Country Head and Chief Executive Officer, BMO Financial Corporation; Edward Wehmer, President & CEO, Wintrust Financial Corporation; and Alejandra Castillo, National Director, Minority Business Development Agency (MBDA). Additional speakers will be announced shortly. More than 5,000 guests are expected to attend the 2014 Make the Connection! Hispanic Business Expo. The event will include more than 115 exhibition booths and 12 free educational business workshops. Exhibitors include business leaders from the public and private sectors and top Hispanic entrepreneurs and professionals. This event is free and open to the public. Persons interested in participating can learn more about the 2014 Make the Connection! Hispanic Business Expo as well as get up-to-date information regarding workshop topics, exhibitor information and other news at: www.hispanicbusinessexpo.net.